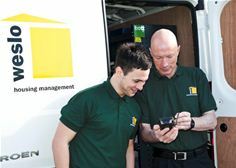 Weslo Housing Management has chosen the latest mobile workforce technology from 1st Touch (www.1sttouch.com) to manage its reactive repairs, pre and post inspections and void management. The new software is expected to deliver a range of efficiency and customer service benefits. A Registered Social Landlord operating predominantly in the West Lothian and Falkirk areas, Weslo has a stock of over 2400 properties. It also has an estate management role for a further 3,500 homes for private owners. Weslo’s key objective is to provide affordable, good quality, rented housing for its tenants. An important element of meeting this objective was to gain the efficiency and customer benefits available from investing in mobile technology. As Weslo had chosen Aareon’s QL Housing Management system for its back-office operations, they were already aware that the market’s leading mobile workforce technology was available to integrate with this system. As 1st Touch mobile software works seamlessly with its back-office counterpart it was felt to offer the ideal solution. In addition, 1st Touch’s award winning mobile technology is platform agnostic, so it will work with Weslo’s existing Motorola ES400 handsets, and iPads, or any alternative handheld platform used in the future. These factors along with supportive comments from other social housing organisations reinforced the decision to choose 1st Touch. Weslo use 1st Touch to support the work of its 22 DLO reactive repairs operatives along with the 4 inspectors who carry out pre and post inspections and report on the condition of voids. With the new system in place, jobs will come in from QL direct to the operative’s PDA, allowing work to be effectively scheduled and controlled. Before completion of each job the system also allows for the addition of any stock used, assisting in the overall stock management for the company.